The exhibition takes over the entire Renwick Gallery building, bringing alive the maker culture of Burning Man through artworks, room-sized installations, jewelry, costumes, and ephemera that will transport visitors to the gathering’s famed desert location, the “playa.” Immersive works by individual artists and collectives highlight the ingenuity and creative spirit of this cultural movement. 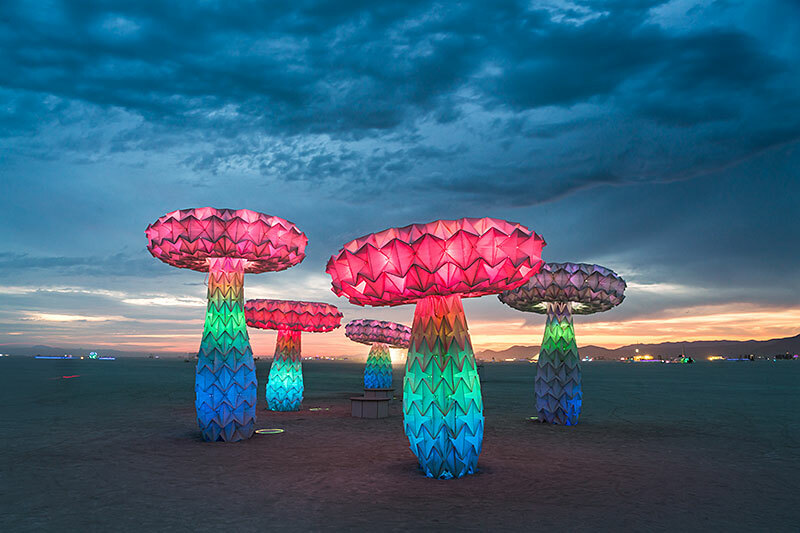 Photographs and archival documents drawn from the Burning Man Archives at the Nevada Museum of Art and their exhibition City of Dust: The Evolution of Burning Man will trace Burning Man’s growth and its bohemian, counterculture roots. The first floor galleries will be open through September 16, 2018. This includes works by Candy Chang, Marco Cochrane, Duane Flatmo, Michael Garlington and Natalia Bertotti, Five Ton Crane Arts Collective, Scott Froschauer, Android Jones, and Richard Wilks. The second floor galleries will be open through January 21, 2019. This includes works by David Best, FoldHaus Art Collective, Aaron Taylor Kuffner, HYBYCOZO (Yelena Filipchuk and Serge Beaulieu), Christopher Schardt, and Leo Villareal.